I’m delighted to welcome James D Mortain to my blog today. He- like me- is something of an accidental author- although out entry into the wonderful world of words is very different. I consider myself something of an accidental author. Well, up until a sequence of events changed my outlook on life, the concept of writing a novel had simply never crossed my mind. In 2011, I was a detective in Bath CID with twelve years’ service behind me. My wife and I had been struggling to have a family for a number of years, but in this particular year, we were to be in luck! We had embarked on fertility treatment. For those reading this going through the same process, you know what ‘hope’ really means. It was a challenging pregnancy. My wife was in and out of hospital more times than I can remember. We knew we were going to have a little girl, due in the early part of January, but October came, and so began the sequence of events that would change my life. It was early October when I received the first calls from my mother stating that my father wasn’t well. He was a strong man. He might have been a grumpy old git from time-to-time, but he was rarely unwell. Days passed. His condition worsened. The family knew it was serious. Mid October and dad was having tests at the hospital. By late October, he was diagnosed with widespread cancer. Just days later, he was gone. My wife, now heavily pregnant, my commitment to the job, my family, my emotions, everything was spinning, but we had to ensure the health of my wife and our unborn child. A few weeks later, having said our final goodbyes to my dad, a magical thing happened; my wife began labour pains — not so magical for her — but at last, we had a brief respite of positivity. It was 22nd December. On the 23rd, she was admitted to the maternity unit. We spent the late evening watching the clock — would we have a Christmas Eve baby? The clock went beyond midnight — yes, we would … oh! … No, we wouldn’t. Christmas Eve came and went. Christmas morning arrived and it was snowing outside in the hospital car park. The countdown was on and at just gone midday, my gorgeous daughter, Gracie, was born. The mixture of emotions we felt was obvious, but in my arms I held the most precious of gifts on Christmas Day. I returned to work a father, having lost my own. Suddenly, priorities were different, concerns were changed and it provided clarity to my wife and I as to what was important and what we wanted the future to hold for little Gracie. My mother-in-law, Liz, lived in North Devon, a place we loved to visit, particularly Westward Ho! We decided to prospect on the sale of our house in Bath — we had tried previously without a single viewing, but this time we had four full asking price offers on the first day! That was it — our sign. Offers agreed, we found a home in North Devon, but then came the hard part; I had to leave my job. It was a huge shock to all of my colleagues, but the relief and anticipation for me was overwhelming. All I had to do now was find a job in my new neighbourhood — how hard could that be? August 2012, I was jobless, seriously homesick, missing my mates and missing the buzz of the job. I arranged to meet my old uniform colleagues for a night out in Bath and then the most significant event occurred. Towards the end of the night, I had consumed a skin full of booze. I got chatting to a chap seated alongside me at the end of the bar. He’d been to a book signing event at Toppings & Co. I asked him who he had seen (I had seen the brilliant Lee Child there a year or two before); his response, “It was mine, actually.” I didn’t have a clue who he was, I apologised for not recognizing him and I asked for his name. Turned out I was chatting with Chris Ryan, ex-SAS veteran and author of many successful books. You can imagine my excitement at meeting a real-life legend. We continued to chat. He told me a little of his life as an author; I told him what I had recently done, and in that short conversation, the spark of creativity within me was ignited. Next day, I enthusiastically relayed my chance encounter to my wife and mentioned something that he had said: that I had the knowledge and real-life experience that most crime writers would dream of having and why didn’t I consider writing a novel? To my astonishment, my wife agreed to the idea. The trouble was I had no writing experience, no specific writing qualifications and frankly, no idea of what I was doing. However, I tried it anyway and later that same day I opened the laptop and Detective Deans was born. I gave the story a title, I knew the kind of real-life case I wanted to develop and I simply let the story take me where it naturally wanted to go. What I hadn’t anticipated, was just how addictive writing would be. My story soon became a major focus in my life. I was now employed during the day, my little girl was growing and I was lucky that my wife indulged my ‘whim’. To her, it was my new hobby. To me, it was so much more. After a year, the draft of STORM LOG-0505 was completed, but what was I going to do with it next? I truly believed in my story. I just couldn’t imagine anyone else being interested, after all, I still didn’t know what I was doing. I finally allowed a few people close to me to read it. They liked it. Some even loved it! I recruited professional help and found an editor. He picked my story apart, but crucially, he liked it too. I reached the stage where I had edited the thing so many times that I was making changes for the sake of it. I decided to take it to the next level and seek an agent. I threw all of my efforts into submissions and amazingly, within 48 hours of my first cast, I had a reply. An agent was keen to see my full manuscript. I sent it off. I waited. Soon I had a reply with lots of helpful tips and further proposed changes. I immediately went to work on the manuscript, and then BANG! I was struck down with viral meningitis. I was sick. Very sick. For months, I lost control of my cognitive abilities, my vision changed, I suffered with blistering headaches and I battled with chronic fatigue. And with it, my hopes of gaining an agent evaporated, but … everything happens for a reason. My condition slowly improved, I eased myself back into my day job and I took stock of the situation. I began writing again and I regained control. I wasn’t going to beat myself up and knock myself down with disappointment. It was time to go it alone. I found a designer, Jessica Bell, who designed a fabulous cover for my story. Suddenly, my book was real. Editors polished the content and formatters made the inside look attractive. And then, in April 2016, STORM LOG-0505 was released to the world. For any author, releasing a new book is a special moment. For me, it was an achievement of Himalayan proportions. I watched the Amazon sales report like a hawk, waiting for those initial sales to start flooding in … but nothing happened, and so began my second publishing crash-course in marketing and promotion. I wasn’t using Facebook or Twitter at the time, but I soon began to build my platform and the sales started to trickle through. Then reviews came … and they were good … in fact, they were amazing! Four and five stars. People were actually enjoying my story AND wanting more! This trend continued until almost a year after its release, and one morning I woke up to discover STORM LOG-0505 had a little orange banner beside it on Amazon Kindle that said, ‘Best Seller’. My novel had reached the top spot in Psychic Suspense. Imagine my bewilderment! I held author events — I absolutely loved them. Incredibly, people were bothering to hear me talk about my writing. I thought it was bonkers, yet all the while, I was working on the sequel. 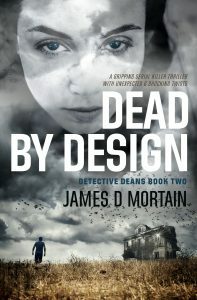 Taking a third of the time to write and a third of the cost to publish, in November 2017, DEAD BY DESIGN was released. A week later, it too had a little orange banner beside it on Amazon Kindle. Today, buoyed by the positive reviews and many kind messages I receive from my readers, I actually ‘feel’ like an author. I strive to improve and learn with each page I write, and each day I wake up and know I am closer to realising my goal of becoming a full-time writer. Unexpected and magical things can really happen. Six years ago, I was slogging away at my desk, and thanks to a brave decision and a chance encounter, my new pathway in life couldn’t be further removed. We all suffer knockbacks and disappointment and I’m sure for me more will follow, but at least when it does, I can honestly accept that no matter how bad it might feel at the time, everything happens for a reason. 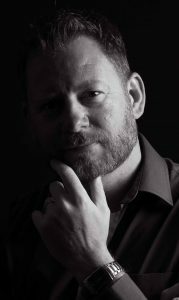 James D Mortain uses an author pseudonym and brings authenticity to his work through twelve years of police service with the Avon and Somerset Constabulary. His father’s death and the birth of his first child shaped a defining period and re-evaluation of his life, resulting in 2012 with his resignation from the police force and a move to North Devon. Jobless and homesick James returned to Bath visiting friends, where a chance encounter and conversation with successful author, Chris Ryan, motivated him to start writing. Believing everything happens for a reason and nothing happens by chance, James embarked on creating a fresh British detective series influenced by his police experience and infused with paranormal overtones, inspired by a close friend with extraordinary ability. James has created a character in Detective Deans, who must challenge everything he has been taught to believe. 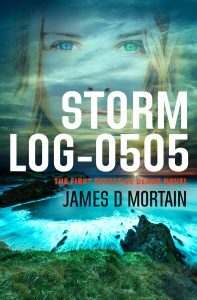 In the first book, STORM LOG-0505, Detective Deans hunts for a missing student, but what he discovers in a small North Devon community exposes him to a ‘paranormal awakening’ and the perilous clutches a sophisticated killer. DEAD BY DESIGN is the series follow-on and pits Deans against his greatest challenge yet. The final part of the trilogy is in the making and will be published in 2019. The wait is almost over for Detective Andrew Deans; years of agony and despair hanging on the results of his wife’s fertility treatment. But a student is missing. And he must find her. Compelled to leave his wife in Bath, Deans heads to North Devon, where he encounters Denise Moon, a medium, who exposes him to a psychic dimension he could never have imagined existed, in what soon becomes a murder hunt. Gripped by a mysterious happening attributed to his own paranormal awakening and alienated from all but his new mystical muse, Deans is closing in on a sophisticated killer, but all is not as it seems and Deans’ future is about to change. Detective Deans is back in this highly anticipated crime thriller sequel, but this time he seeks far more than just the truth! A young couple in their prime is found dead in the marital bed. As they lie naked, staring at each other with eyes wide open – filled with fear, his colleagues assume a double suicide, but Detective Andrew Deans senses that darker forces are at work. Deans is facing an awakening – a spiritual birth, but he is stuck in a living nightmare. Those around him are watching … judging … expecting him to break. As he waits to hear the news he dreads most, Deans receives an unmarked DVD and the true meaning of horror is revealed. Playing by the rules is getting him nowhere. Now, it’s time to do things his way. But death and tragedy haven’t finished with him… yet. When a fly-on-the-wall documentary crew drops in on a night shift in Bath city centre, PC Ellie Grange and her team are fuelled with anticipation at the thought of becoming TV reality stars. They need it real, they want it uncensored, and they crave a true-to-life experience of the demands faced by Britain’s cops on our streets. It’s a beautiful evening – the first night shift of a set in the historic Georgian city… what could possibly go wrong?